In an article titled “On Libertarian Bolshevism”, conservative blogger Adam T. Yoshida argues that we see two approaches being proposed to achieve a free society that not only are doomed to fail, but also make it more difficult for a “Reactionary Libertarian” to achieve a freer society. Yoshida implies that the Reactionary Libertarian has an approach that can achieve freedom in a society that is either indifferent to, or hostile to, the goal of a free society: “going back to some older social structures and institutions”. Yoshida says that first of the two allegedly flawed approaches is a libertarianism which advocates liberty without actually caring whether or not it is achieved. He is most certainly correct to suggest that there are many self-styled “libertarians” who like to talk about principles, integrity and freedom only to make themselves feel like lonely geniuses, but who believe a free society to be impossible. It is that misguided pessimism which explains why you can rarely find a “libertarian” willing to help out at election time. But, so defined, such lazy, excuse-making, libertarian paralysis is not an approach to the achievement of anything at all. Yoshida is far too generous in giving such despondency the status of an “approach” to “construct liberty”*, and his mention of such libertarianism adds nothing to his argument. Accordingly, I will add nothing further in respect of the first “approach”. In Rand’s book a libertarian society is created when all of the great minds of the world voluntarily withdraw their services and then, following the inevitable collapse of civilization that follows, take over to run things. The society envisioned by Rand in the final pages of Atlas Shrugged could only be a dictatorship and, given the descriptions of all that preceded it, probably a brutally oppressive one at that. My interpretation of [Atlas Shrugged] has a long history, going as far back as Whitaker Chambers who wrote that, from every page of the book a voice could be heard commanding, out of necessity, “you, to a gas chamber – go!”. Either through ignorance or manipulation, Yoshida neglects to mention that Whitaker Chambers’ review of Atlas Shrugged was, famously, even more misrepresentative of the book’s content and meaning than Yoshida’s. It has been argued, in recent years, that Chambers’ own review is evidence that Chambers did not even read “Atlas Shrugged”. 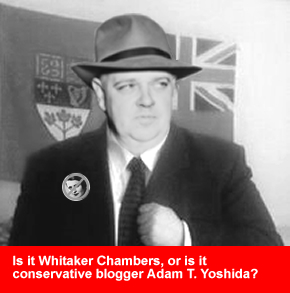 Yoshida neglects to mention that Chambers had himself been a communist spy working with Russia and, such being the case, he apparently considered Rand’s untainted defence of capitalism and the pursuit of happiness something he needed to combat. He neglects to mention that Chambers was writing his “Atlas Shrugged” book review for William F. Buckley’s National Review, and that Buckley was, throughout his life, trying to reconstitute and maintain conservativism in the USA in such a way as to exclude any person or group who had integrity; any person or group who did not accept the notion that everything – including the facts of reality and ethics – can be the subject of a compromise if some sort of gain can be achieved, or loss avoided, in the immediate term. National Review has re-printed the article a number of times (in 1990, 1999, and 2005) since its initial publication decades ago (1957), precisely for the purpose of trying to keep conservativism a short-sighted, pro-mystical, anti-individualist, pro-central-planning, non-Objectivist movement. The article was a smear designed to influence the nature and course of conservativism in the USA and, if Yoshida does not know it, he has not done the tiniest bit of research into the sources from which he chooses to “learn” about Ayn Rand’s philosophy and works. “Get this straight,” said Dr. Ferris, addressing him for the first time. “We want you to take full power over the economy of the country. We want you to become a dictator. We want you to rule. Understand? We want you to give orders and to figure out the right orders to give. Galt was looking straight at them, his face expressionless, as if he understood too much. He did not answer. “Number three,” said Ferris, raising a finger in signal. The mechanic pressed a button under one of the dials. A long shudder ran through Galt’s body; his left arm shook in jerking spasms, convulsed by the electric current that circled between his wrist and shoulder. His head fell back, his eyes closed, his lips drawn tight. He made no sound. When the mechanic lifted his finger off the button, Galt’s arm stopped shaking. He did not move. The dictatorial government’s attempt to make Rand’s hero assume the role of dictator fails because no rational person would want the job, and because every individual’s mind is sovereign: no amount or type of force can cause someone to think if they choose not to do so. In Atlas Shrugged, the dictatorial government – employing various taxes, wealth redistribution schemes, and outright slavery – finds its coercive efforts powerless to cause the novel’s heroes to produce anything. Coercion being no replacement for rational thought, the dictatorial government is powerless to save the economy, and it falls as the lights go out in New York City. In the last chapter of Atlas Shrugged, Rand’s heroes and heroines return from their hideaway in Galt’s Gulch because the rest of society has – in their absence – learned that survival and happiness depend not upon government’s laws, threats and guns, but upon each person’s choice to produce and voluntarily to trade values by thinking and acting rationally. Contrary to what Yoshida says, in the last chapter of Atlas Shrugged, society has finally rejected totalitarianism and is ready voluntarily to embrace a system in which government and economics do not mix. For Yoshida to use “Atlas Shrugged” as a proof that Rand’s ideal society is one of necessity governed by totalitarian government is evidence either of his failure to have read and understood “Atlas Shrugged”, or of intellectual dishonesty in the Chambers tradition. Third, Atlas Shrugged was a novel. The purpose of the novel was to portray the ideal man in a way that explained to the reader Rand’s metaphysics, epistemology, ethics, politics and esthetics. It was not a proposal for how to achieve freedom in an unfree world. Ayn Rand did write about that subject explicitly in her non-fiction and she did not, in her non-fiction, advocate a repeat of John Galt’s plan. Nor have I ever heard any Objectivist or libertarian of note suggest that the path to freedom is a repeat of what the character John Galt did in Atlas Shrugged. Yoshida is straw-manning both Objectivists and libertarians. …requires such a wrenching change – a jump from Tuesday to Friday – that it could never be achieved by any means compatible with freedom. The Libertarian Bolshevik, on the other hand, doesn’t worry about [various problems associated with various proposals to eliminate oppressive laws] because they simply intend to sweep everything aside at once, using the magic which can only be accompanied by dictatorship. I like to think of liberty as a “guiding star” of sorts. We ought, as best we can, to move in that direction, even if we already know that we can only get so far. “…do not and are not intended to represent an exhaustive or ultimate set of policy implications resulting from the party’s founding principle: they do not describe a final destination. Rather, they set out ports of call along the way to a freer, more personally responsible Ontario society. As such, they allow Freedom Party’s leadership to determine the right direction for the governance of Ontario, and to steer accordingly. Nor are these policies exhaustive. Ethics, not law, is the foundation of political freedom. Laws designed to protect individual freedom are a necessary, but not sufficient, condition of individual freedom and personal responsibility. Changes in governance do tend to influence the dominant code of ethics, though law’s influence is limited, especially where the law is not respected. And, because a change in ethics takes place only within the mind of an individual, change in the dominant ethical code of society inevitably is gradual. Freedom Party of Ontario, being a political party, must be satisfied with its role: to attempt the restoration of the necessary legal and political framework for an ethical, hence free, society. In fulfilling that role, Freedom Party must be cognizant of the fact that pro-freedom changes to the law are likely to be transient if they are made so quickly that ethics has no chance to catch up. The policies that follow have been chosen in light of the fact that just as the erosion of freedom has been gradual, so will the restoration of freedom take time, patience, ethical growth and, with respect to changes in governance, gradual steps. Although these policies specify ports of call, they do not specify which ports of call should be approached first, how quickly they should be approached, or what course should be charted around obstacles to their approach. Such decisions must be made in light of current events, and with wisdom concerning what is politically feasible. In short, it is utterly false for Yoshida to state or imply that those who – like myself – refuse to compromise their ethical commitments are, of necessity, people who would resort to coercion in a misguided effort to achieve freedom, or people who propose overnight, revolutionary change. A gradual restoration of freedom does not require one to compromise ones commitment to freedom, ones rational code of right and wrong, ones commitment to reason, or ones commitment to the facts of reality. To the contrary, freedom cannot be restored if such compromises are made. …I’m not absolutely opposed to dictatorship, certainly not in the Roman fashion, where it is necessary. I’m a life-long fan of, for example, Augusto Pinochet. But what a Randian society…entails is a form of totalitarianism – a boot stamping on the human face forever that happens to be marked “Liberty”. Moving towards liberty is going to require time and some degree of coercion – I think that we need to be realistic about that. No genuinely democratic government, for example, is ever going to be able to do away with Medicare. I do not think it is unfair, or misrepresentative, to sum up these two statements as follows: Yoshida does not reject totalitarianism per se. He is opposed to “genuinely democratic government”, and believes that freedom can be achieved through – and only through – coercion. He nonetheless expects the reader to believe his claim that he loves freedom, to take his advice when it comes to the matter of how a freer society should be achieved, and to believe that his so-called “libertarian Bolsheviks” are the people who undermine the efforts of his Reactionary Libertarian ilk to achieve a freer society. I submit that freedom means control over ones own life, liberty and property; it requires physical force to be used only to defend or restore that control; it requires the absence of coercion. Totalitarianism refers to a system in which everyone’s life, liberty and property can be or is controlled by the state; in which force is used, by the state, to obtain that control; in which government has unlimited jurisdiction to coerce the governed. Though I do not think “totalitarian” is the technically correct descriptor for an autocratic monarch whose main aim is to reduce the scope of government’s involvement in the economy, someone who does not oppose totalitarianism is not truly a lover of freedom. The opinion of such a person on matters of how to achieve a freer society is not merely worthless. It is poison that, in the end, serves only those who abhor freedom. *NOTE: I reject the notion that liberty is something that one constructs, but that is an issue for another article. My opinion of Yoshida just went way down. Implied in Yoshiba’s comments is a, not unusual, association between capitalism and ‘extremism’ /dictatorship (be it left-wing or right-wing based). In Europe, where I live, capitalism is almost always linked to fascism. And that’s where any further study of the argument stops for 99% of these critics. There seems to be little understanding and willingness to understand capitalism as the only vision that supports individual freedom. As in Yoshiba’s case, the accusations say all about the metaphysics of the critic and nothing about capitalism itself. To me it sounds unbelievable that in 2008 people say that Atlas Shrugged (1957) proposes a dictatorial solution. I cannot believe they actually read the book of 1200 pages of explanation. Well done.. mr. Yoshiba. The road to freedom has nothing to do with ‘extremism’ or dictatorship, but with an understanding in people’s mind. Would anyone believe that a sticker on my car’s rear window stating ‘Enjoy Capitalism’ in coca cola style actually shocks people, but when, in election time, the city is filled with posters showing Hammer and Sickle (responsible for millions of deaths) nobody even questions that?? I agree, it’s all in Ethics. I would add psychology too, however. Capitalism requires self-reliance and maturity. That is something people want to avoid often. It’s better to be pampered they think. But when you discover the ‘taste’ of independence, not only capitalism becomes logical, but one can see that of course between Yoshiba’s ‘two approaches’ vision (the ‘withdrawn pessimist’ and the ‘wannabe dictator’) there is a third option: rethink your ethics and start living accordingly. To people who want to see that, sooner or later capitalism won’t be a threat. And to those who don’t want to understand: have a look at government involvement in the economical collapse in the US nowadays. Excellent analysis of another conservative dimbulb. I had not come across Yoshida before, but the picture of himself he posts on his blog is enough to raise concerns for me. And Ralf – I agree with your commentary. Ethics is number one, but psychology ties it. This is my pet subject and if I was younger, I would return to school. We desperately need a brilliant Objectivist psychologist. Many people resist the obvious truth of Objectivism for both philosophical and psychological reasons. For many I believe, their psychology is the major obstacle. Unfortunately the field of psychology has largely developed in an atmosphere of abysmal philosophy so we are facing a steep uphill battle. We need a rational psychological framework, which will take a long time or someone brilliant on the order of Ayn Rand. That was a terrific essay. From time to time, Whittaker Chambers’ outrageous review of Rand’s writings is wheeled out by sneering conservatives or by those who want to portray Rand as some sort of nutter. They rarely, if ever, point out that Chambers’ agenda, like that of Buckley, was to attack Rand, or indeed any other Objectivist/libertarian who defended the free society without regard to religion. They hated Rand because she built her argument on rational foundations, not those of revealed religion. To this day, conservatives who are Christians cannot deal with this in a mature way. Hence the smears. He is most certainly correct to suggest that there are many self-styled “libertarians” who like to talk about principles, integrity and freedom only to make themselves feel like lonely geniuses, but who believe a free society to be impossible. People adopt a philosophy as a Goth would where a dog collar; it is almost an adolescent struggle for identity and superiority. I don’t like that what I support gains the support of individuals like this. Perhaps when my ideas become more mainstream (as I think they are) these kind of people will leave.